← You can’t open the book of my life and jump in the middle. 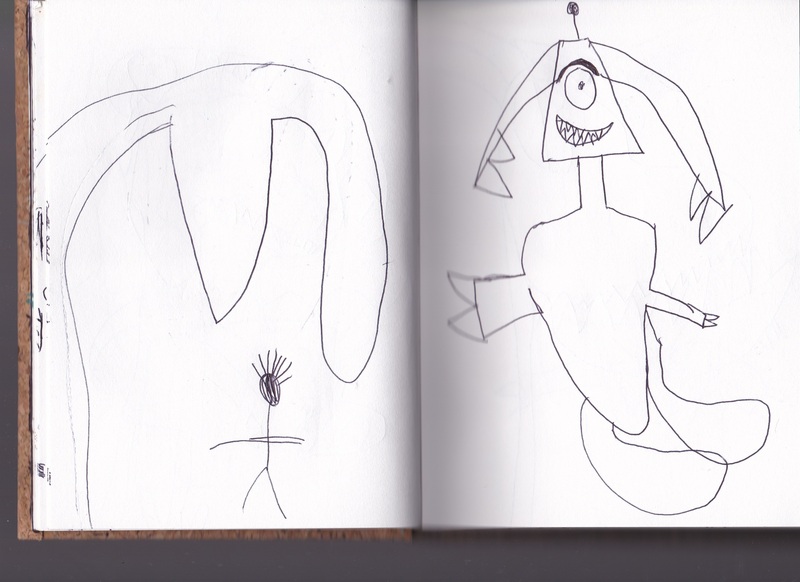 So this week we have a post from the sketchbook of Doodlehoose Jr. However, I forgot to ask him about what it means last night. I’m sure that J has an explanation for the drawing above, but for now you get to interpret it all by yourself. Man sized Venus fly trap on the left, happy alien ghost on the right… those are my guesses. Sorry you lose. J says that the one on the left is a giant sized hand and the one on the right is a cliffhanger tooth. They are fighting. The hand is eating the guy and the cliffhanger tooth is coming over to get him.